HOLLYWOOD, California - The late Selena Quintanilla, the undisputed Queen of Tejano music, was memorialized with a much-anticipated star on the Hollywood Walk of Fame on Friday. 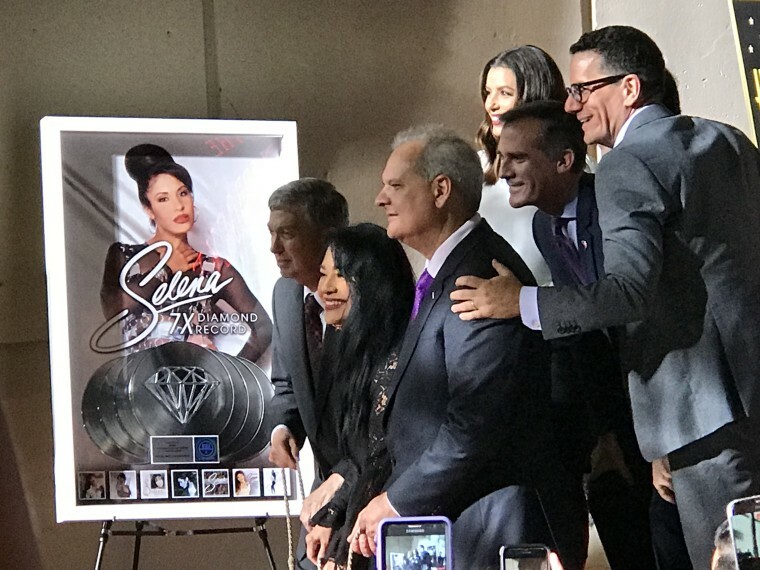 Though she has been gone for more than two decades, Selena remains one of the most popular and influential Latina music icons, and her enduring legacy was evident in the star-studded ceremony on Friday amid her family, celebrities and city officials, and legions of adoring fans. "This star is for every Latina out there who has ever had a dream," said actress Eva Longoria, who grew up in Selena's hometown of Corpus Christi, Texas, in a moving speech. "Growing up there was no reflection of me - not in TV, not in movies, and not in music, it was as if someone like me didn't exist in mainstream America. That all changed when a bright young singer named Selena changed the music landscape." At the ceremony, Suzette Quintanilla quoted her sister's words, "Selena said, the goal isn't to live forever, but to create something that will." And that Selena did; she rose to fame among Mexican Americans and in Latin America with her signature blend of Tejano ballads and contemporary pop. Some of her most popular songs include: Bidi, Bidi Bom Bom, Dreaming of You, No Me Queda Mas, Amor Prohibido and Como La Flor. At 23, she was about to debut her much-anticipated crossover album when she was shot to death on March 31, 1995, in her hometown of Corpus Christi, Texas. Yolanda Saldívar, the founder of her fan club who had been fired for embezzlement, was convicted of first-degree murder. Yet her popularity has endured. As of 2015, 65 million of her albums had been sold worldwide. The 1997 film "Selena," starring Jennifer Lopez as Selena and James Edward Olmos as her father, currently ranks as the 12th highest-grossing musical biopic of all time. For fans, Friday's event was a necessary milestone for the Tejana legend. “I’m always going to love her music and what she stood for, but this, as a fan, this is what I was waiting for to give her death closure," said Joel Peña, 47, a 3rd grade teacher from Texas who traveled to L.A. for the ceremony. Born on April 16, 1971 in Lake Jackson, Texas, Quintanilla became the lead singer in her family's band, Selena Y Los Dinos, when she was 10. Although she grew up speaking English, her father taught her to sing in Spanish so she could better relate to her Latino fans. She learned the lyrics phonetically at first, and eventually taught herself to speak Spanish fluently. In 1986, the Mexican-American singer won the Female Vocalist of the Year at the Tejano Music Awards and in 1989 she signed with the newly-formed Los Angeles record label EMI Latin and released her first of five record-setting albums. In the mid-1980s, The Selena Foundation was founded and Coca-Cola appointed her its Hispanic ambassador and spokesperson. Her crossover album, Dreaming of You (1995), debuted posthumously. It went on to win Album of the Year at the 1996 Tejano Music Awards and Female Pop Album of the Year at the 2nd annual Billboard Latin Music Awards. Admired for her unique fashion sense, she was sometimes called the “Tejano Madonna” after her self-made, rhinestone-studded bustiers and unabashed dance moves. Yet she was also seen as the wholesome girl next door, and was a point of pride for so many U.S. Latinos. Many young Latina girls carry her name, including actor Selena Gomez. In 2015, an online petition was started to name a M.A.C. cosmetic line after the singer, and in 2016, the limited edition makeup line launched. In October of this year, Google launched a video Doodle marking the date of Selena's first studio album release. Set to her song Bidi Bidi Bom Bom, the Doodle chronicled her life, and ran in 18 countries for 24 hours. "There were always two women who taught me I could do anything and be anything I set my mind to: my mom and Selena," said Perla Campos, Global Marketing Lead for Google Doodles and project manager for the Selena Quintanilla, in an interview with Billboard. "Selena has been a part of my life for as long as I can remember." In an interview with NBC News, Campos said Selena's legacy has only grown with time and shows no signs of stopping. "She represents all that is positive about Latino culture and I have no doubt she’ll continue to be an inspiration for generations to come." For fans like Peña, Friday's moment was bittersweet. “There were certain things that needed to happen after she passed away - she was taken away prematurely. Of course the statue at the Wax Museum, and I was happy to see that happen, but I wanted to see her have this star on the Walk of Fame. I think it’s time to let her rest now."